Each year the spring blossoms in the garden serve as a visual reminder to change the air filters at Midori Haus. We have multiple layers of protection to keep out bugs, pollen, dust, and unpleasant smells in the neighborhood. 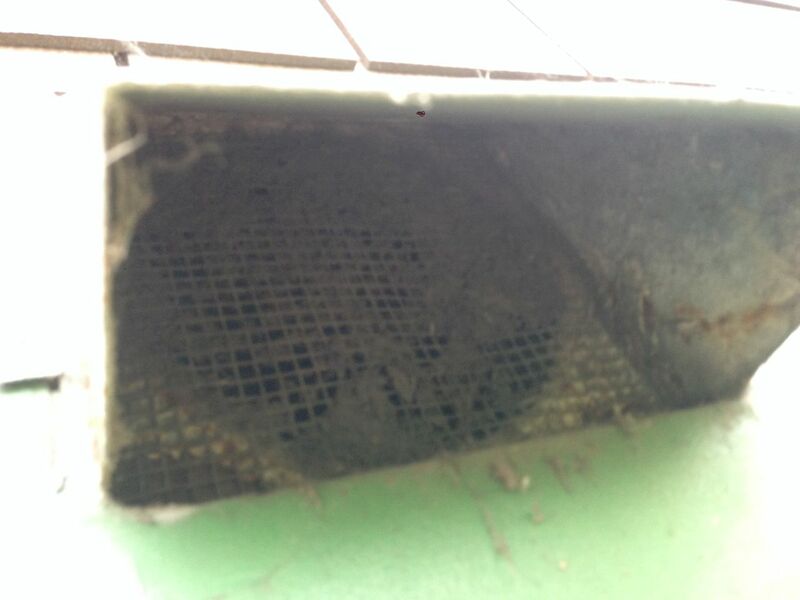 In this post I'll share the maintenance activity we did in April and May: 1) Cleaning the bug screen; 2) Replacing the activated charcoal filter in the ComfoWell; 3) Replacing the Red filter for supply air; 4) Replacing the Black filter for the return air. Below is a simple diagram (not to scale) showing the 4 filter locations. We have the ComfoAir 350 model from Zehnder. It is a heat recovery ventilator (HRV) that is continuously providing fresh air into the house and expelling stale air out of the house. 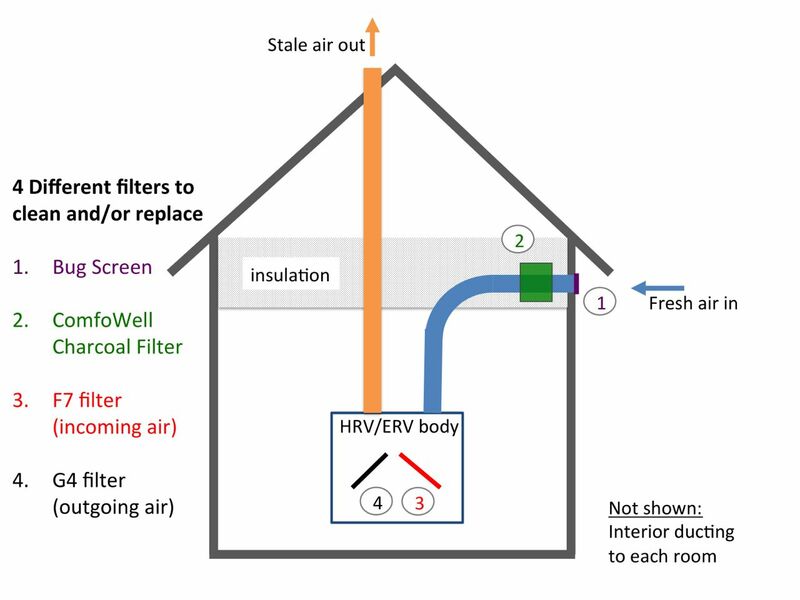 In the winter, we change out the HRV core with the energy recovery ventilator (ERV) core. 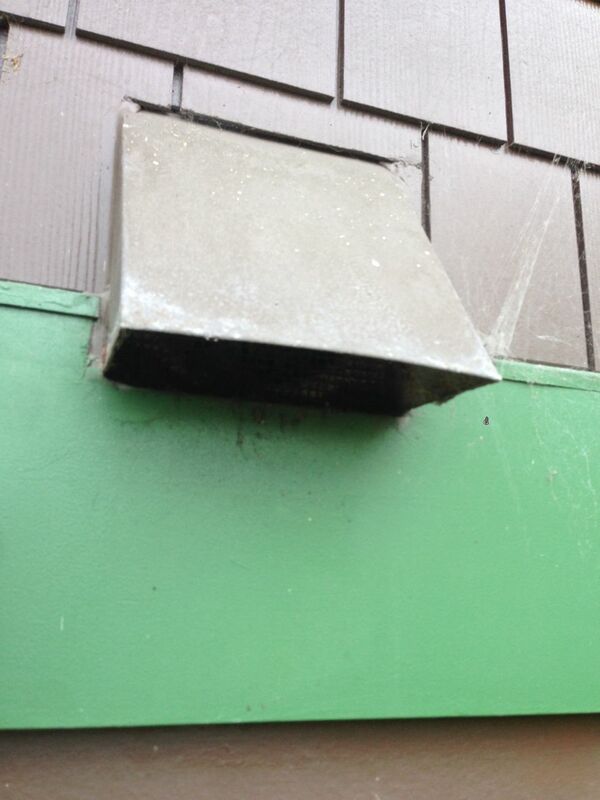 The ERV recovers moisture as well as heat, making the house less dry in the winter. 1) Bug Screen. The wire mesh, our first line of defense, was dirty. It covers the edge of the 7-inch diameter ComfoPipe at the exterior wall. 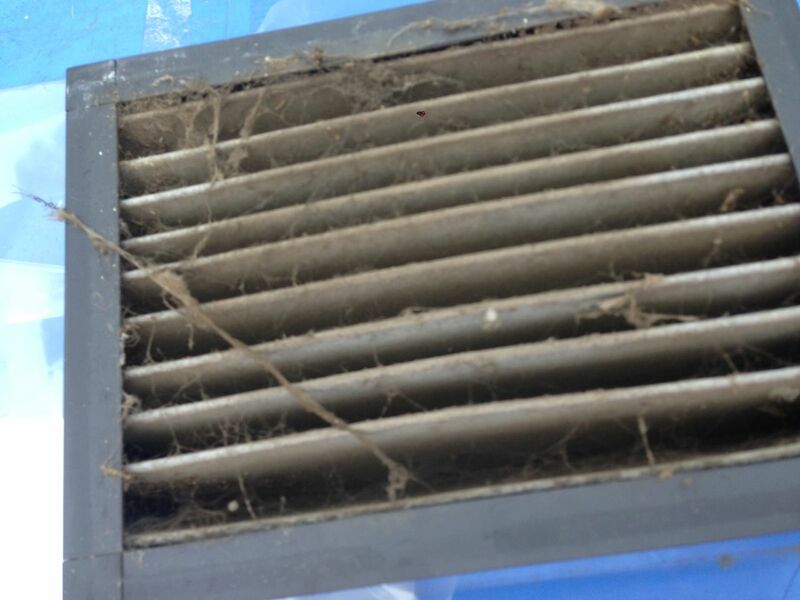 Over half of the surface area was covered with spider webs and dust. I must confess that we haven't cleaned the bug screen regularly. This may be the first time we're cleaning this in five years! This opening is located about 12 feet above the ground on the east wall. 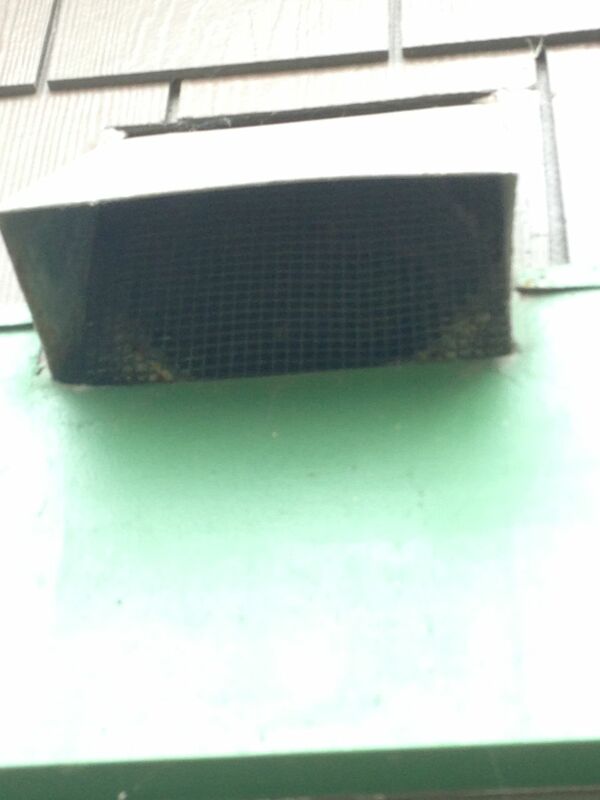 The bug screen has an awning over it to keep out rain. We didn't see how dirty the screen was until we climbed on a ladder to take a close look. We placed a shop-vac on the ladder and vacuumed the accumulated debris on the wire mesh. The first point of entry is now clean. 2) Activated carbon filter in ComfoWell. The housing for the ComfoWell 320 to hold the activated carbon filter is in the attic near the air intake wall. During our first year of living in Midori Haus, we smelled wood smoke and skunk spray inside the house. 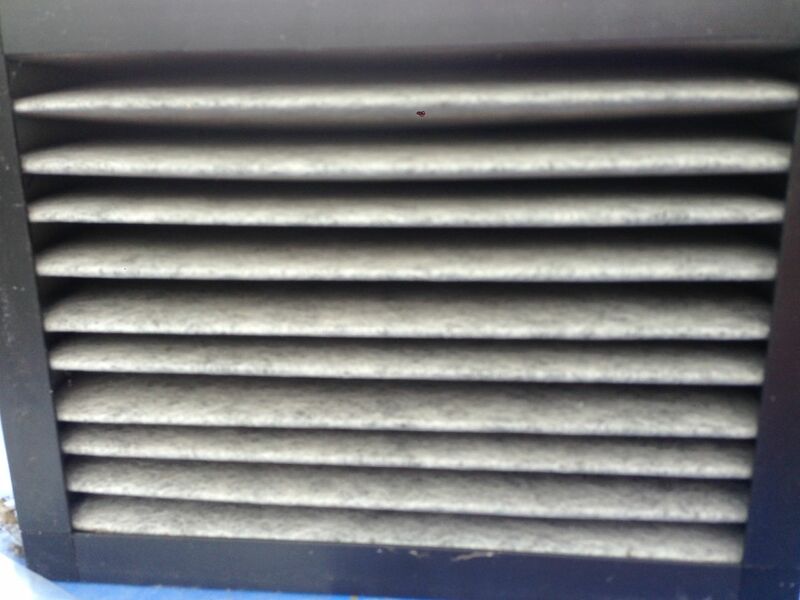 The filter in the body of the HRV didn't remove all of the fine particles. Being awakened in the middle of the night by a frightened skunk in the backyard was very unpleasant. This activated carbon filter doesn't completely eliminate the noxious smells, but it is a huge help. 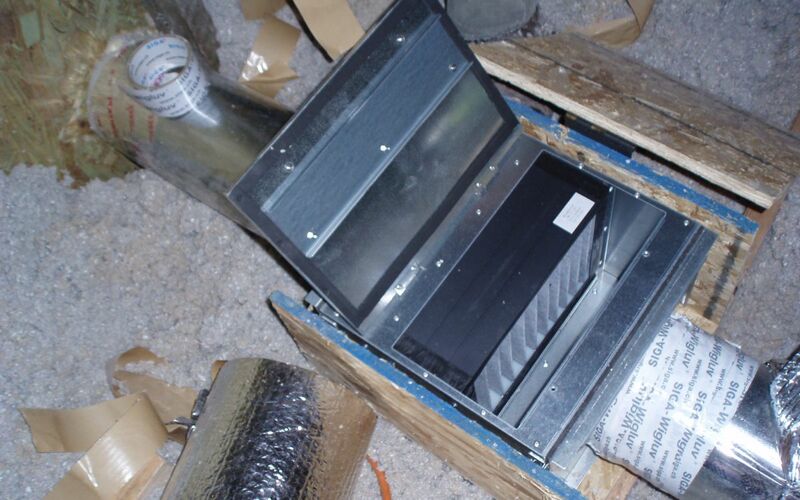 The ComfoWell filter unit is housed in a wooden box to prevent insulation from being sucked into the ventilation system. We have 24-inches of blown in cellulose in the attic. Getting to this box can be messy. The carbon filter after one year of use is very dirty. New carbon filter is very clean. 3) F7 filter for incoming air. The red F7 filter is placed at the right hand side of our HRV. Whatever that got passed the wire mesh screen and the activated carbon filter in the ComfoWell, the F7 red filter will trap. The red filter has a MERV 13 rating. 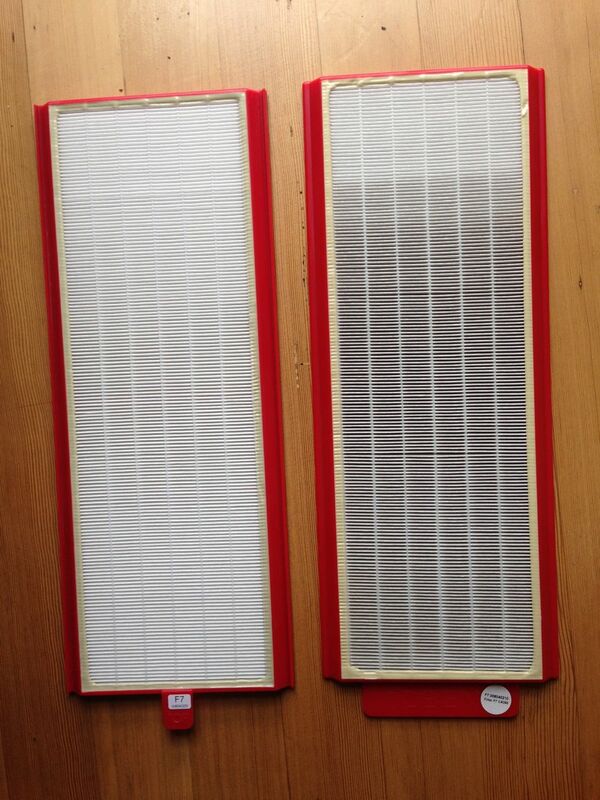 The higher the number, the more effective the filter is at trapping small particles. 4) G4 filter for outgoing air. The black G4 filter is placed at the left hand side of our HRV. This is filtering out particulates that hitched a ride with the return air extracted out of kitchen and bathrooms. At first glance it may seem silly to filter the air before it is expelled out of the house. 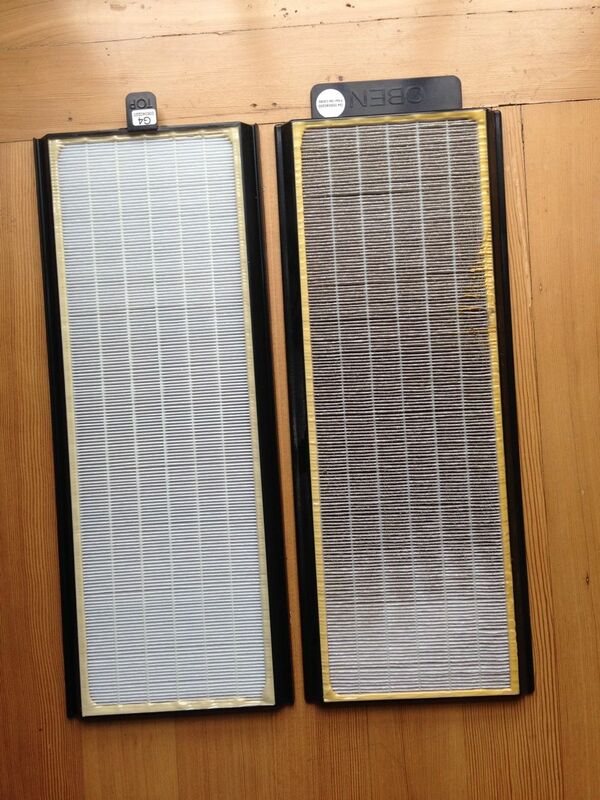 This black filter plays an important role in keeping the HRV core clean. The black filter has a MERV 7 or 8 rating. 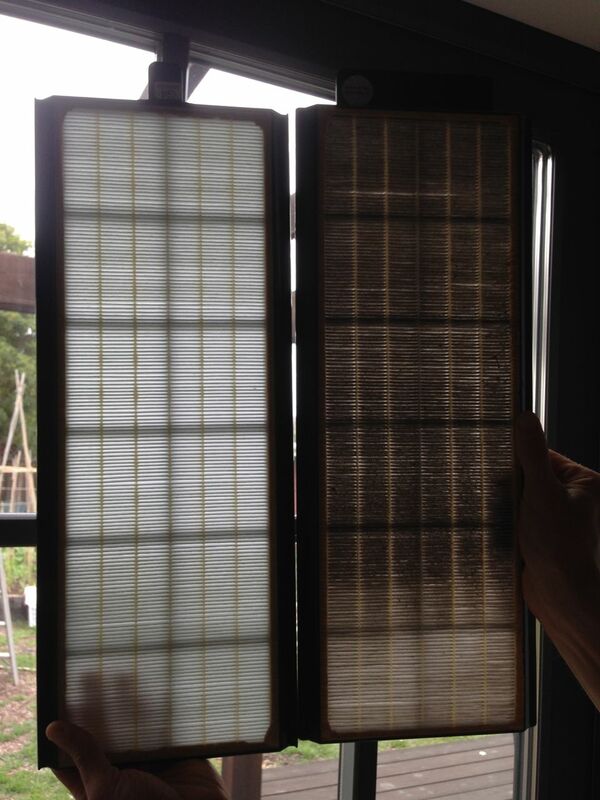 We were surprised to see the black filter to be dirtier than the red filter. Why would that be? It's a reminder that we track in dirt and dust as we go in and out of the house. We add to the particulates in the air when we cook. Since we air-dry our laundry inside the house, all the lint that would have been trapped in the dryer lint trap is floating about inside our house. Every so often, I notice a spider hitching a ride on lettuce or chard I harvest from our garden. In other words, simply living in the house slightly degrades the air quality. A set of filters cost $100 ($53 for activated charcoal, $25 for F7 red filter, $22 for G4 black filter). 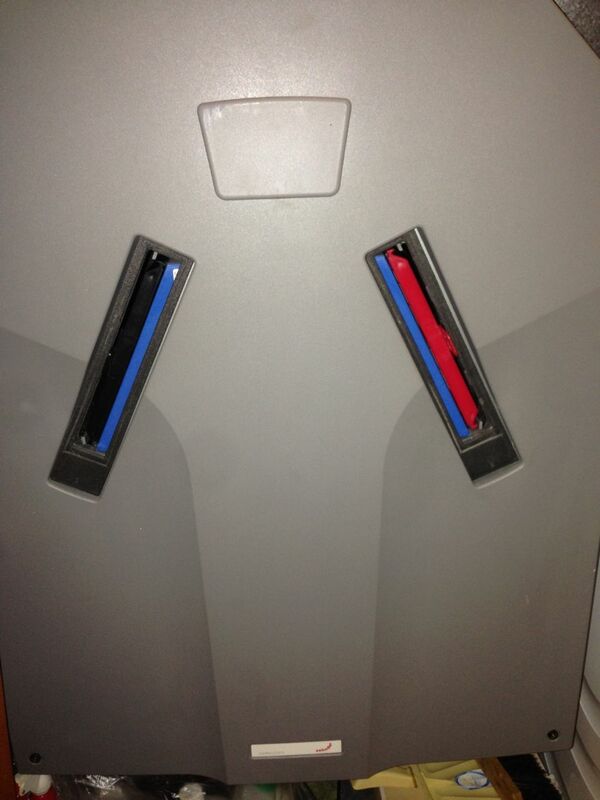 The red and black filters can be reused after cleaning. In the past, we've placed them in the dishwasher and also sprayed it down in the shower. 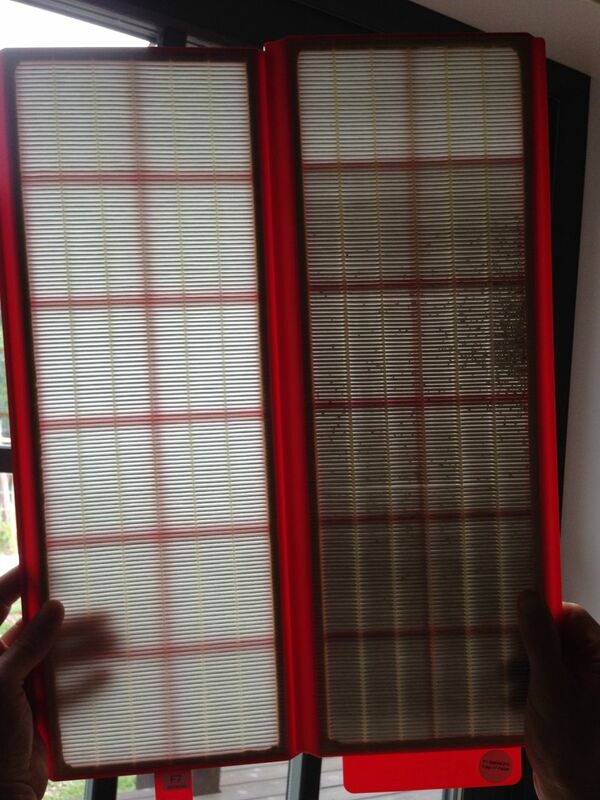 It doesn't get pristine clean, but enough particles are removed to re-use the filter for another 6 months. One final thing to do for this semi-annual maintenance event is to set a reminder in calendar for filter change. I have mine set for November 1 and May 1.